In fourteen hundred ninety-two Columbus sailed the ocean blue…The Nina, Pinta and Santa Maria. This art tutorial is going to give you and your students the joy of an ocean voyage, complete with flapping canvas and great big waves! 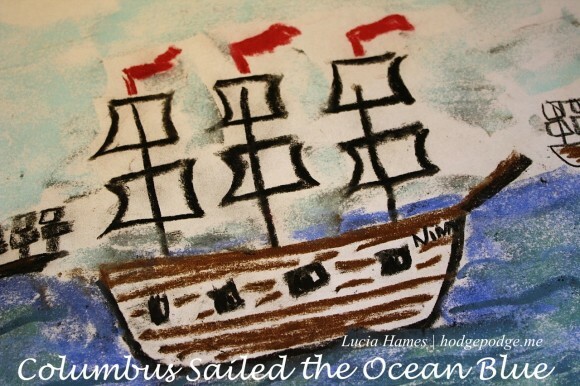 As you know, Columbus Day is upon us, and we must celebrate his journey to our shores with a chalk pastel painting. A big thank you to our subscribers!! Hodgepodge subscribers will find our latest tutorial at the bottom of their subscription email or feed. Subscribe to Hodgepodge here. So, paint your Columbus Sailed the Ocean Blue and be sure to share with us! Simply tag @chalkpastelart on social media, use the #YouAREanArtist hashtag, or upload a photo to the ChalkPastel.com Facebook page! Do you and your artists learn best with a video art tutorial? 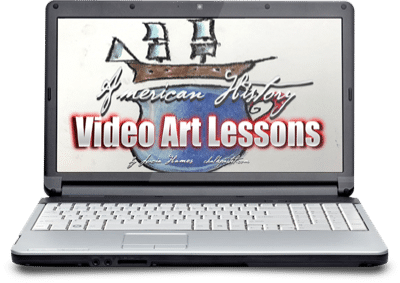 Nana has a video version of this art lesson in our American History Video Art Lessons. Find our Video Art Lessons at ChalkPastel.com! You might also like our History Art Lesson subscription options. –> Thank you to our Hodgepodge subscribers! You can find your Columbus Sailed the Ocean Blue Art Tutorial via a download link on our subscription feed or email. Not a subscriber? Please subscribe to Hodgepodge now (it’s free!). Don’t miss any art lessons! Hi there! I am a subscriber and I didn’t see the tutorial link at the bottom. Just the one for Georgia and the trees. Wanted to send out a HUGE THANK YOU!!! B/c of your blog we started with chalk pastels and acrylics this year and my kids are loving it. Your tutorials are so easy and inspiring that my kids are learning that they really can be artists too. We even have a wire hung up in our playroom (from Ikea!) that clips their art pages up so we can have an ever changing art gallery wall. Thanks so much! Good morning from Nana at Hodgepodge! Thank you for the very kind words about our pastel tutorials! If you can, please post some of your children’s pictures, I would love to see them! And remember: You CAN be an artist! Hi Kelly – I am following up with an email to you about the tutorial. But, like Nana, I love to hear you are your children are loving the tutorials. I also LOVE the idea of a wire gallery to hang all your beautiful pictures! I will have to check that out at IKEA. I appreciate you taking the time to comment! Got the link for the tutorial- thanks! and sent you the link for the ikea wire. Here it is for others incase they are interested. Just to clear things up – new subscribers – those subscribing today via the sign up box in the upper right hand corner – will receive an email with the link attached to download the art tutorial. And current subscribers will receive a new email tomorrow with the link to download the tutorial. We did have a technical difficulty that made the link miss today’s subscriber email (10/8) but there is a post going up tomorrow – and the link will be there. I so appreciate your patience friends! I’m having trouble finding it as well. Glad to see I’m not the only one. We love your tutorials! I have a group of 11 kids (including my own) scheduled to come over and do projects from your Fall Chalk Pastels book! Fun, fun, fun! Hi…I’m a subscriber and I didn’t find the link in the email either as someone else noted above. Where is it? Hi, I just became a subscriber tonight and I am wondering if I will receive an email with a link to the Colombus chalk art tutorial. We are meeting with some friends tomorrow to try chalk art, and I think the guys would really enjoy creating the ships. Thank you!